I like the colour red and I like [duct] tape (as you can see from the way I've decorated my commode/shower chair) - but I HATE the tangled and messy red tape of bureaucracy! As you can imagine, last night I was so upset and fretful about the situation with my broken commode/shower chair - I had visions of my employees holding me suspended over the toilet to do my business! My friend Natasha thought her partner Zack could reattach the wheel, and then he thought his friend might be able to do it instead. Sadly, in the end, nobody could reattach the wheel. However, Lucy had a bright idea! She found the actual manufacturer of my commode/shower chair on the internet and saw that they sell the wheels separately. I was so happy and hopeful about this turn of event! Maybe I'd get a new wheel today or tomorrow, who knew? In the morning, Yuula assisted me in calling the manufacturer right away. The person we spoke to seemed very nice and helpful. He was appropriately appalled when I told him that Motion Specialties said it would take three days for me to receive a loaner commode/shower chair. Unfortunately - and here's where the red tape comes in! - the manufacturer explained that I couldn't simply order and buy the new wheel myself (naw, that'd be too easy!) I would have to contact Motion Specialties again and ask the people there to fax a prequisition order form to the manufacturer, and once they received that then they would contact a courier service who would then deliver it to me. 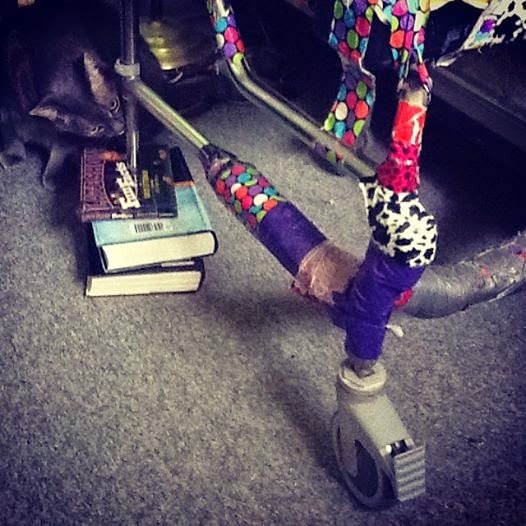 Don't get me wrong, I'm deliriously happy that I'll be getting a new wheel fairly soon instead of losing my broken-in, very comfortable commode/shower chair to Motion Specialties (for god knows how long!) in exchange for a loaner, which may be either fine or torturous! I just don't understand why I had to play phone/email tag with these two companies instead of cutting out the middle man and buying the wheel myself! Sure, I had similar situations when I was on ODSP because the govermnet was paying for any devices I needed, but now I'm off ODSP and have to buy things myself. Will I ever escape the dreaded red tape when I need to get devices fixed or purchased? Well, anyway I'm happy that soon I'll be getting a new wheel. And, I'm glad I have cool, great, fanastic and brilliant friends who think up ways o help me out of difficult situations! Yes, Lucy, you are a genious for thinking of putting books under my commode/shower chair. Thank you!